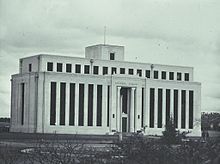 A., D., E., F., G., H.
The present library building was opened on 15 August 1968 by Prime Minister John Gorton. The building was designed by the architectural firm of Bunning and Madden in the Late Twentieth Century Stripped Classical style. The foyer is decorated in marble, with stained-glass windows by Leonard French and three tapestries by Mathieu Matégot. The building was listed on the Australian Commonwealth Heritage List on 22 June 2004. The Library has digitized over 174,000 items from its collection (the 100,000th being [nla.gov.au]) and, where possible, delivers these directly across the Internet. The Library is a world leader in digital preservation techniques, and maintains an Internet-accessible archive of selected Australian websites called the Pandora Archive. ^ "NATIONAL LIBRARY ACT 1960 - NOTES". www.austlii.edu.au. Retrieved 31 July 2017. ^ "NLA Annual Report 2015-2016 | National Library of Australia" (PDF). nla.gov.au. Retrieved 25 July 2017. ^ a b c d "Collection statistics | National Library of Australia". Nla.gov.au. Retrieved 12 November 2013. ^ "CDP - How we collect". National Library of Australia. Retrieved 31 July 2017. ^ a b "National Library of Australia and Surrounds, Parkes Pl, Parkes, ACT, Australia (Place ID 105470)". Australian Heritage Database. Department of the Environment. Retrieved 22 March 2019. ^ "Our Building". nla.gov.au. National Library of Australia. Retrieved 25 July 2018. ^ "NLA.gov.au". NLA.gov.au. Retrieved 30 May 2012. ^ Sue Ebury (2008). The Many Lives of Kenneth Myer. The Miegunyah Press. p. 319. ISBN 0-522-85546-6. ^ "National Library of Australia – Our Collections". nla.gov.au. Retrieved 3 August 2012. ^ "Catalogue Home | National Library of Australia". nla.gov.au. Retrieved 12 November 2013. ^ "National Library Facts and Figures". nla.gov.au. Retrieved 25 July 2012. ^ "Ferguson Collection | National Library of Australia". www.nla.gov.au. Retrieved 2 February 2017. ^ "NLA.gov.au". NLA.gov.au. 12 December 1984. Retrieved 30 May 2012. ^ "NLA.gov.au" (PDF). Retrieved 30 May 2012. ^ "National Library of Australia – Pictures Collection Development Policy". nla.gov.au. Retrieved 3 August 2012. ^ "National Library of Australia – Pictures". nla.gov.au. Retrieved 3 August 2012. ^ "NLA.gov.au". NLA.gov.au. 1 October 2007. Retrieved 30 May 2012. ^ "NLA.gov.au". Librariesaustralia.nla.gov.au. Retrieved 30 May 2012. ^ "Services". National Library of Australia. NLA.gov.au. Retrieved 1 February 2016. ^ "National Library unveils web-based treasure Trove". ABC News. 28 April 2010. ^ "Trove.nla.gov.au". Trove.nla.gov.au. Retrieved 30 May 2012. ^ "HISTORY OF THE LIBRARY". National Library of Australia. Retrieved 1 April 2015. ^ "Friends Farewell Jan Fullerton". National Library of Australia. 15 September 2010. Retrieved 29 September 2010.